Wolin [ˈvɔlin] (German: Wollin) is a town situated on the southern tip of the Wolin island off the Baltic coast of Pomerania, modern Poland. The island lies at the edge of the strait of Dziwna in Kamień Pomorski County in the West Pomeranian Voivodeship. The town, now a fishing port and gateway to the island's bathing resorts, has a population of approximately 4,900. Dating from the 9th century, it has been associated with the semi-legendary settlements of Jomsburg, Jumne, Julin and Vineta. It played an important role in the conversion of Pomerania and in 1140 became the first see of the Pomeranian diocese. Several ruins from the Slavic period occupy the area. The early medieval town fell victim to the late 12th century Danish raids, and was refounded in 1260. 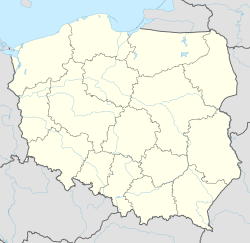 Since 1945, the town has been part of Poland. The ford across the river Dziwna on which Wolin is located has been used as far back as the Stone age. Archaeological excavations of soil layers indicate that there was a settlement in the area during the Migration period, at the turn of the 5th and 6th centuries. The place was then abandoned for approximately hundred years. At the end of the 8th or the beginning of the 9th century the area was leveled and a new settlement constructed. The earliest evidence of fortifications dates to the first half of the 9th century. In the second half of the 9th century there was a central fortified area and two suburbs, to the north and south of the center. These became enclosed and fortified between the end of the 9th and the 10th centuries. In the 8th century there was a West Slavic settlement on the island. The name of the local tribe was recorded as "Velunzani" (Wolinians) in the 9th century by the Bavarian Geographer, and is considered a sub-tribe of both the Slavic Pomeranians and the Veleti (later Lutizians). The Wolinians are described by Jan Maria Piskorski as the most powerful Pomeranian tribe, due to their control of a multi-ethnic emporium at the site of the present-day town. Similar emporia were also set up elsewhere along the southern coastline of the Baltic Sea since the 8th century. This emporium, by contemporary chronicles referred to as Jumne or Julin, began to prosper in the 9th century. Archaeological research has revealed seaside fortifications that have been dated back to the beginning 10th century, and also remnants of older fortifications, probably pointing to an earlier burgh with an adjacent open settlement. In the 960s, the Jewish merchant Ibrahim ibn Jakub described the settlement as a town with several thousand inhabitants and twelve gates. Besides the Wolinians, there were Scandinavian, Saxons and Rus' (people). Later, the town was mentioned in the chronicles of Adam of Bremen. Adam mentioned a lighthouse, which he described as "the lamp of Vulcan". All these descriptions contributed to the Vineta legend. Though other towns are also considered possible locations of Vineta, it is believed today to be identical with Wolin. The same is true for Jomsborg, a stronghold set up by Danish king Harald Bluetooth and Swedish prince Styrbjörn in the course of Harald's internal struggles with his son, Sweyn Forkbeard, in the 970s or 980s, which housed a garrison of soldiers known as Jomsvikings. In the late 10th century, the Polish dukes Mieszko I and Bolesław I Chrobry subdued parts of Pomerania and also fought the Wolinians. Despite a victory of Mieszko in a 967 battle, the Polish dukes, according to Jan Maria Piskorski, did not succeed to subdue the area. [verification needed] Władysław Filipowiak however says that the battle "probably led to the establishment of the rule of the winner over the town." In 1982, Joachim Herrmann suggested that Boleslaw had established a Viking colony under Palnatoki there to defend his realm, a thesis that in 2000 had been revisited by Leszek Słupecki who like Władysław Duczko (2000) called for further research on resident Vikings in Jomsborg/Wolin. Filipowiak says that, based on the archaeological evidence, "there might actually have existed in Wolin a mercenary company placed by the Piast rulers in the unruly town, which in 1007 informed the German Emperor that Boleslaw the Brave had been weaving a dangerous plot," but also points out the need for further research on this subject. The meeting with Henry II, Holy Roman Emperor in Regensburg on 6 April 1007 resulted in the latter declaring war on Boleslaw, after Wolinian and other delegates had reported that Boleslaw was preparing for war and had sought their support by offering money and making promises. Oskar Eggert and Filipowiak say that suggests that the town was independent in its policies by that time. Filipowiak further says that in the 11th century, Wolin became a "save haven for Danish refugees, which in that period led to inner unrest and conflicts as well as pirate activities." Much of Wolin was destroyed in 1043 by Dano-Norwegian King Magnus the Good, who however failed to conquer its center. Also in the mid-11th century, export and wealth were greatly reduced, in part due to the breakdown of the Polish market. Yet the Wolinians retained their independence and continued to house refugees from the Danish opposition, causing Danish king Erik I Evergood to mount another campaign in 1098. In 1121/22, the Polish duke Bolesław III Wrymouth conquered the area along with the Duchy of Pomerania under Wartislaw I. Boleslaw aimed at Christianizing the area and in 1122 sent the Spanish eremite Bernard on a mission to Wolin. The inhabitants, reluctant to convert to a religion of a man who did not even wear shoes, beat him up badly and expelled him. With the approval of both Lothair III, Holy Roman Emperor, and Pope Callixtus II, Boleslaw initiated another mission of Saint Otto of Bamberg in 1124. When Otto, a respected and wealthy man accompanied by German and Polish clergymen and military units, arrived in Wolin, he had already successfully converted the Pyritz and Cammin areas. Yet, he was met with distrust, and the town's inhabitants finally gave in to convert to Christianity only if Otto managed to convert Szczecin, which the Wolinians assumed was unachievable. Yet, when Otto after two month work and threatening with another military intervention managed to convert Szczecin, he returned to Wolin and the Wolinians accepted conversion. Otto's second mission in 1128 was initiated by Holy Roman Emperor Lothair in 1128 after a pagan reaction. While this second mission was oriented more towards Western Pomerania, Otto also visited Wolin again. Wartislaw I, Duke of Pomerania supported and aided both missions. In 1140, Wolin was made the first episcopal see in Pomerania: Pope Innocent II founded the diocese by a papal bull of 14 October, and made Wolin's church of St. Adalbert its see. However, the see was moved to Grobe Abbey on the island of Usedom after 1150. At the same time Wolin economically decayed and was devastated by Danish expeditions, which contributed to the move of the episkopal see to Grobe. The Danish campaigns completely wiped out the town in the late 12th century. On the ruins of the early medieval town, a new town was founded and granted Lübeck Law. The town remained in the Duchy of Pomerania (which was within the Holy Roman Empire since 1164/1181), passing with the Duchy of Pomerania-Stettin to the Swedish Crown following the Treaty of Stettin (1630), the Peace of Westphalia (1648) and the Treaty of Stettin (1653). Since the Treaty of Stockholm (Great Northern War) of 1720, it was incorporated into the Prussian Province of Pomerania. The town subsequently became part of the German Empire then its successor states the Weimar Republic and the Third Reich. In 1945, with the conclusion of the Second World War, Wollin was conquered by the Red Army and handed over to Poland and the German population was expelled. The town was once again named Wolin and resettled by Poles. Anna Maria of Brandenburg (1567 – 1618 in Wollin) Princess of Brandenburg by birth and marriage Duchess of Pomerania. ^ Filipowiak, Władysław (2004). "Some aspects of the development of Wolin in the 8th-11th centuries in the light of the results of new research". In Przemysław, Urbanczyk (ed.). Polish lands at the turn of the first and the second millennium. Institute of Archeology and Ethnology. Polish Academy of Sciences. pp. 47–74. ^ Eggert, Oskar: Geschichte Pommerns, vol. 1, Hamburg 1974, p. 45: "Danach scheint sich Wollin als unabhängige politische Kraft an der Ostsee behauptet zu haben." Filipowiak, Wladyslaw: Wollin - ein frühmittelalterliches Zentrum an der Ostsee, in Wieczorek, Alfried; Hinz, Hans (eds. ): Europas Mitte um 1000, Stuttgart 2000, pp. 152-155; here p. 154: "was ein Hinweis auf eine eigene unabhängige Politik der Stadt sein könnte." ^ Filipowiak, Wladyslaw: Wollin - ein frühmittelalterliches Zentrum an der Ostsee, in Wieczorek, Alfried; Hinz, Hans (eds. ): Europas Mitte um 1000, Stuttgart 2000, pp. 152-155; here p. 154. ^ a b c Filipowiak, Wladyslaw: Wollin - ein frühmittelalterliches Zentrum an der Ostsee, in Wieczorek, Alfried; Hinz, Hans (eds. ): Europas Mitte um 1000, Stuttgart 2000, pp. 152-155; here p. 154-155. This page was last edited on 3 April 2019, at 16:26 (UTC).